Ideable will be presenting zocaalo in Vienna as a marketplace of certified apps for the elderly people. It is a way to help to build accessible and usable apps for these end-users and certify that they fulfill with the basic requirements for this sector. In this pitch, we will also offer access to the webinar in which everyone can know more about zocaalo, and can apply with their apps for the certification process that will be for free only for some weeks during this summer. AAL2Business is a three-year support action launched by the AAL Joint Programme. 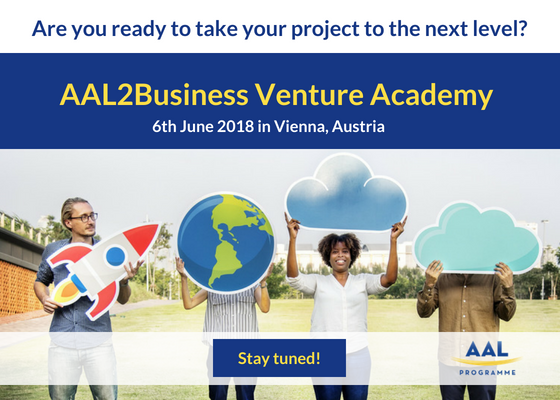 Its main objective is to help companies in their business development and commercialisation challenges related to solutions developed under AAL projects. It offers a wide variety of support actions addressing AAL JP projects in different stages of their lifecycle: from before obtaining the funding until after the end of the project. This session is supported by the AAL Programme. The Active and Assisted Living (AAL) Programme promotes innovative technological product ideas and services for active and healthy ageing, supporting them until they launch on the market. Everyone can know more about zocaalo and can apply with their apps for the certification process that will be for free only for some weeks during this summer.